While the ruins of the Haitian Sans-Souci provide a theatrical attraction in front of the building of the Akademie der Künste in Tiergarten, you have to enter the KunstWerke (KW) at Auguststraße to realize the attractions. The two story central space in the basement has been transformed into an abandoned battlefield bathed in an orange light by Dineo Seshee Bopape. It reminds me at strangely illuminated days, when dust from Sahara sandstorms travel into central Europe and the sunlight changes its color. Becoming aware of the reason of the orange light we might realize that this atmospheric phenomenon connects two continents. Perhaps the matter of the smashed bricks covering major parts of the floor, contain parts of original Sahara-sand. Among numerous artworks at KW there was a video that attracted me. It suggested a re-interpretation of Oedipus by Grada Kilomba. She challenges the power of the ancient myth by seven dancers, including herself, who was the storyteller, too, and music. The research examines whether or not the myth has the power of predicting fate and biography of humans and their relatives. 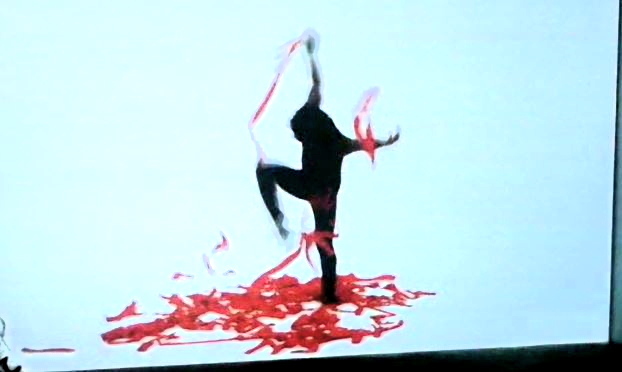 The video presents ways, in which the dancers act, move and play to break the spell of the role. How strong is the frame given by the oracle, and when the spectators cannot identify the play anymore. Kilomba accepts the plots and the persons of the myth and fulfills the symbolic form up to a certain point and despite of her intention to get rid of the symbolic system as a semantic relic of oppression. The only chance is to actualize the frame in which every person acts and shoulders the struggle against the spell as a challenge in searching variations to escape the power of the past. Other impacts against self-determination are unrest and wars. The French-Lebanese movie “La Femme qui chante” (2010) drastically shows that chaos creates a contemporary variant of the ancient myth of Oedipus. Facing the trouble in the world, we should appreciate the optimistic version of Iocaste and Oedipus by Kilomba and enjoy the dancing couple freeing itself by breaking with traditions. 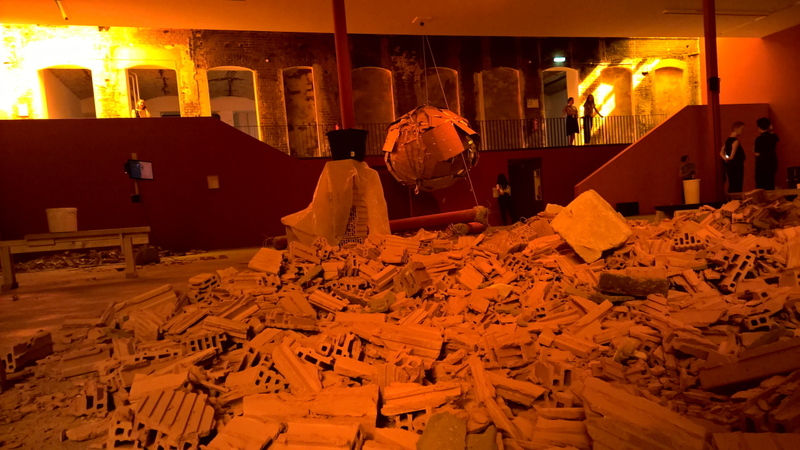 Returning to the impressive installation in orange, spectators find themselves in a singular environment covered with debris, which is overshadowed by a sphere made from cardboard by Jabu Arnell. Hanging over a disastrous scene it can be associated with Darth Vader’s Death Star rather than with a “Discoball” as it is named ironically. Two smaller objects by Robert Rhee rotate on top of pillars from corners of smashed walls. Extending grotesquely through a grid of steel the two organisms, which after examining them can be identified as pumpkins having survived the simulated disaster which happened in this space. It is hard to tell whether these fruits survived thanks to the cage or despite of it. 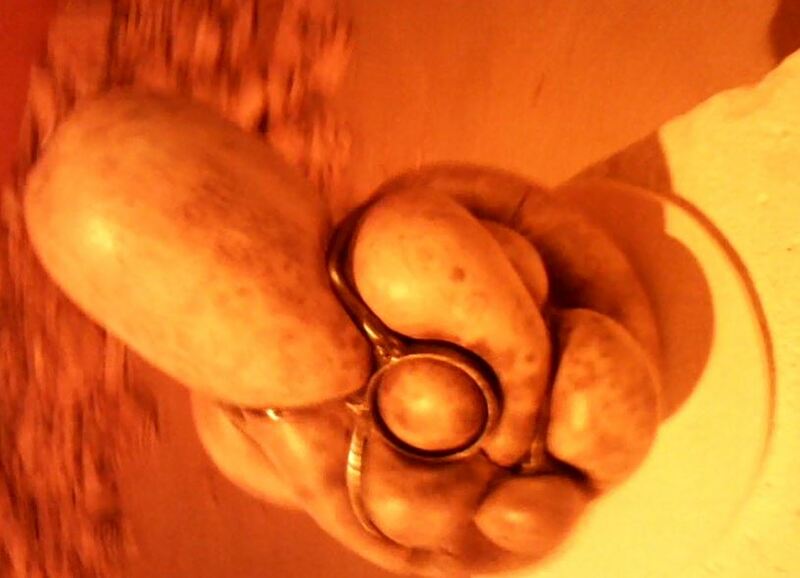 Dieser Eintrag wurde veröffentlicht in Neuigkeiten, Rezensionen und verschlagwortet mit Ausstellung, Berlin-Berlinale, Installation, Zerstörung von hannes. Permanenter Link zum Eintrag.